Alrighty folks, our first movie pick for the The Catholic Community Cinema Society is none other than The Princess Bride! 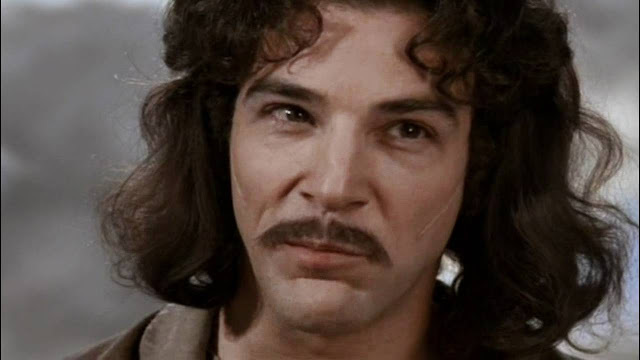 I’m an 80’s baby and grew up in the Princess Bride era and probably heard many references to it growing up but it wasn’t until my late teens/early 20’s even that I watched it. My friends took pity on me when I finally admitted I had no idea what they were talking about and invited me over for a fun movie night. Once we were there, I realized they loved this movie so much that they knew every.single.word of the movie line by line. I realized this because these two friends (who shall remain nameless but you know who you are!) of mine said every single line of the movie word for word from the beginning to end. Needless to say, we spent more time laughing and giggling about their amazing talents rather than watching the movie so I didn’t really get to watch it for myself the whole way through until last fall with my twelve-year-old daughter. That time around, I really got to enjoy it better. 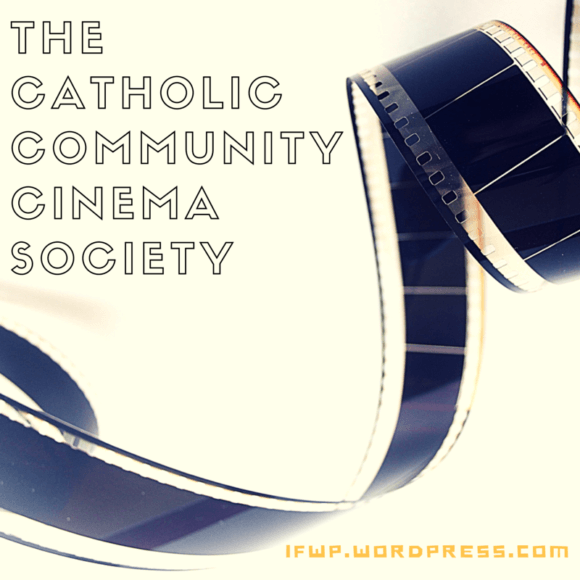 My daughter loved it then so I didn’t have to ask her twice if she wanted to watch it again this week so I could carry out my duties as a member of the The Catholic Community Cinema Society. If you’re in the mood for a fun and easy movie you can easily sit down and watch with your spouse or maybe even your whole family, the Princess Bride wont’ let you down. You’ll find yourself chuckling at all the witty commentary and all the awkward situations the characters find themselves in together are so inconceivable you’ll have to laugh. As an early 30-something-year-old nostalgic for my 80’s/90’s childhood, the things I love about the movie are traits others probably wouldn’t even notice like the scenes in “Kevin’s” room (Fred will always be the Wonder Years Kevin to me). If you pay attention to other movies made during this time, notice the sets. Whoever did the sets back then knew what a family’s house and boys’ rooms really looked like compared to the modern-day home sets that look like…well like sets of an unrealistic family home. And check out the moms hair!! I’m sure my fellow member of the CCCS, Mary Big Hair, would have a few witty things to say about her hair so I’ll just stop there with that one. I loved the relationship between Kevin and his grandpa (Columbo!). Like Joel points out also, the “device” (that’s cinematic nerd speak there) of the bedtime story is pretty ingenious and makes otherwise awkward moments with kids funny instead. I promise I will not kill you until you get to the top. and Fezzik – the brute that is made to look like a big dumb ox but is really the one with the greatest conscience and big heart. I just don’t think it’s right, killing an innocent girl. Just goes to show you should never judge a character by their size, who they socialize with, or their line of work. Then again, who can’t love Vezzini’s over-the-top villainism at least a wee bit? Oh, and I also really liked Mrs. Witch Doctor. Now, I hesitate to admit who I least like because I’m afraid of what this admission will do to my relationships, not to mention the status of this blog and the CCCS itself. But, alas, a good movie review can’t be all fun and games now can it? It may surprise you to know that I really dislike Princess Buttercup and Westley. Don’t throw anything at me!!! 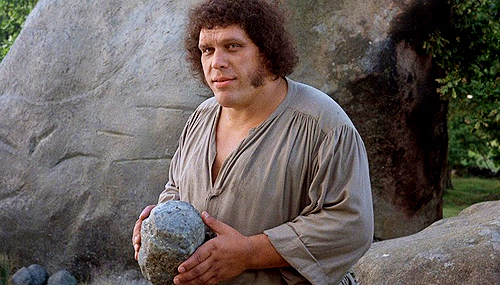 We are all wooed by Farmboy Westley’s smoldering “As you Wish” in the beginning but, when he comes back as the Dread Pirate Roberts, his submissive genteelness is replaced with a somewhat arrogant machoism that I found repelling more than charming. At this point, Princess Buttercup may be wondering who this man is and what has he done with her dear Farmboy Westely. Now, Princess Buttercup, irks me simply because she starts off as a somewhat strong female character – bravely jumping out of the ship to escape until she realizes she’s jumped into the eel-infested waters. That scene, and Vezzini’s “I suppose you think you’re so brave” comment lead me to think Buttercup might turn into a heroine later but no. She plays the classic “damsel in distress” who can’t seem to do anything to save herself, not even reach up and take off her blindfold even though her hands are only tied together at the wrists and can only stand by and idly watch while her “beloved Westley” is attacked and almost eaten alive by the R.O.U.Ss. in the fire swamp. Her naïve trust in Prince Humperdink’s promises and her suicidal mopiness just about did me in. But, she redeems herself a little with her brave and graceful jump out the castle window into Fezzik’s big strong arms at the end. So all in all, the Princess Bride is a fun movie filled with a generous amount of wit that the whole family can sit down and enjoy together. Even with Princess Buttercups weak female character and Westley’s pirate arrogance, it’s a nice-and-easy love story – even if overly typical – with family-friendly adventure and swordplay to make up for the kissing and medieval romanticism. Ok, you’re turn! Head on over to Joel’s blog post and share you commentary or link to your own blog post about what you love – or don’t love – about the Princess Bride! Next up, in The Catholic Community Cinema Society’s movie line up for August is my husband’s all-time favorite, The Shawshank Redemption! I’m looking forward to watching it and this time, I’ll try and watch and blog about our August movie pick in August! Princess Buttercup was always my least favorite too. Not a strong character or performance. Thanks Allison, glad I’m not the only crazy (sane) one! I’m sure your boys related to “Kevin” when he showed disgust at the title of the story his grandfather offered to read. I’m sure Zelie will appreciate the movie as she gets older too. Thanks for not kicking me out of the society!